with many top musicians and artists in Northern and Southern California, including projects with Freddy Fender, Connie Stevens, and soundtrack work for the 2013 film "Man of Steel," under the direction of Oscar-winning composer Hans Zimmer. I've also performed and taught seminars at the SWSGA annual steel guitar show in Phoenix, Arizona, and conducted pedal steel classes and seminars throughout California. Between high school and a tour in the Navy in the early 1970's, I caught the slide guitar bug from George Harrison and Leo Kottke. Then a bandmate loaned me his Mom’s 6-string lap steel, which quickly led to acquiring a Fender triple neck non-pedal steel (and no clue how to play it! ), and finally to my first pedal steel, a red ZB student model. That rudimentary pedal steel held incredible music, magic and power for me, and my passionate love for the pedal steel has not wavered to this day. 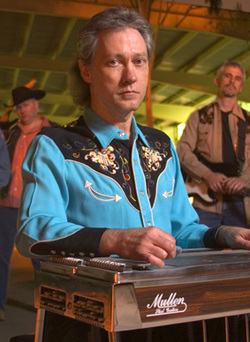 My own efforts to teach myself pedal steel were frustrating at best. I took a few months of lessons from legendary Los Angeles player and teacher Blackie Taylor. Blackie taught me many classic songs and crucial playing positions. Without Blackie’s early help, I probably would have given up. My country-loving Navy buddies and I hung out at quite a few local Long Beach honky tonks, soaking up the playing of great players and idols like Bobby Boyd, Art Sanchez, Red Rhodes and JayDee Maness. ​I’ve always had dual careers in music and graphic design. I served in the early 1980’s as Art & Advertising Director for Tom Bradshaw’s great publication, “Steel Guitarist Magazine,” a true dream job! Teaching was never my goal, but so many beginning steelers were desperate for a nearby teacher, I decided to give it a try. Two things became immediately apparent: off-the-cuff, improvised lessons were too nerve-racking and not very coherent; and existing instructional books that I could teach from were not very logical or properly sequenced. So I began writing my own curriculum, with the goal being, "What should a new pedal steeler know, and in what order should they learn those things?" I have found teaching and writing to be very rewarding. My curriculum trains students step-by-step as both steel players and well-rounded musicians, able to survive on the bandstand and other live playing situations. It works amazingly well with virtually all my students. I’m extremely proud to have been a help to many who now play professionally. Teaching pedal steel is a true calling and mission for me. I love to inspire and help new players, just the way teachers Blackie Taylor and Jeff Newman helped me (and many others) early on in my playing career. I retired from graphic design in 2008, and now focus my energies on session work, live gigs, and, of course, lots of teaching. I teach one-on-one private E9 lessons in my Olympia home studio. In 2009 I expanded into teaching live lessons using Skype videoconferencing technology and webcams. Anyone with high speed internet can now get my help, no matter where in the U.S. or the world you live.